I spent at least an hour on that dang thing. Two virginal casts, and it was gone. Another sacrifice to the gods of rip rap and underwater snags. Somewhere down in that dirty green hued abyss lay a beautiful fly. I had poured love, attention, and detail into that thing. Maybe I should start carrying a wet-suit and goggles, I thought to myself. Should I throw caution and comfort to the wind and make an exploratory dive to salvage that little work of art? The thought was a tempting prospect at the moment. It is painful to lose something created with such care and attention to detail, and only after the second cast. In a grumpy funk I tied on another pattern. This time it was one I could fish and lose without the same agony I had just experienced. Two times in a trip would be more than I could take. I made the switch, cut my loss, and slowly drifted into a focused state. Without the risk of lost artwork, I could dedicate my attention to the reason I was there; to fish. I try not to think about how often this scenario has been revisited. It's a natural following for someone who loves to create and experiment with fly patterns. The flies that are most pleasing to the eye are often the hardest ones to lose. Anglers are left with two options: 1- they can fish beautiful flies, enjoying the confidence they induce, but all the while stressing over the potential snag and loss, or 2- they can fish a basic bread-and-butter fly that took a fraction of the time to tie, is far less painful to lose, is cheaper to make/buy, and induces a different type of confidence born of consistent success. Each scenario has unique consequences. What is a stupid fly? Beautiful and complex flies can create a confidence that is remarkably valuable, but also often results in a distracted angler, who gingerly fishes the fly in a superficial manner, and only hits the sweet spot zones here and there. This confidence is a result of seeing something that resembles the real thing to the angler. It may not move or really look like the real thing at all to a fish, but out of the water it may resemble, at least with the help of our imaginations, what we're trying to mimic. For one of these more artistic, many-materialed patterns, fishing it slower, deeper, or tighter to cover is to risk losing that little labor of love. Bread-and-butter, or what I like to call "stupid flies," can be fished with a reckless abandon. Sometimes they are ugly. Sometimes they don't actually have an apparent relevance to a living thing. These patterns are stupid because they are often extremely simple to tie, and are made of relatively inexpensive materials. They let the angler probe the deepest depths, toughest cover, and snaggiest riffles to get to those sweet spot zones rarely reached by the cautious fly guys. This is one reason the tried and true woolly bugger is so amazing. Simple, cheap, and easy to tie, and probably one of the most effective patterns out there. Usually boring, always effective. 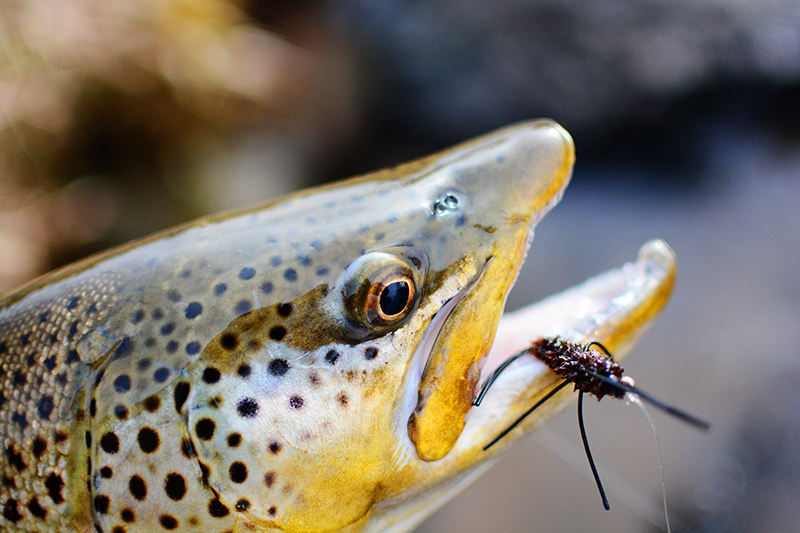 Confidence is a crucial element of success in the world of fly fishing. We work a run differently when we have some degree of faith in the catching. A fly that has so much attention to detail that it truly resembles what it is trying to mimic, or at least gives us that impression, is phenomenal for inducing confidence, but the pain of losing one of these flies is considerable. If the resulting success is substantial, we usually endure the pain. Whether bought or tied, this can be hard on the pocket book. To summarize, one confidence comes from an impressive looking fly, but another type of confidence comes from fishing a fly that just plain works, even in it's simplicity, and can be lost without much remorse. With this kind of confidence an angler fishes the deeper, slower, faster, and snaggier runs, and covers those sweet spot zones better and longer. Anglers who tend to fish the stupid flies are generally more effective. They fish without fear of loss, which is to say, they are far less distracted. Stupid flies are for anglers who like catching. Fancy flies are for those who like to tie, or admire what has been tied on top of the attempted catching. So, if you like catching fish, I highly recommend identifying your stupid flies. If you're nymphing, these could include Pat's Rubber Legs, Glo-bugs, San Juan worms, or mohair leeches. If you are throwing dries, these could be Parachute Adams, Chubby Chernobyls, or Rusty Spinners. If you are throwing streamers, these could be Wooly Buggers, Circus Peanuts, Peanut Envys, or any other glorified, articulated woolly bugger-like streamer. For myself, I always have woolly buggers/leeches, Skullcrackers, and Skullchasers, in my box. These are all flies that are relatively easy and fast to tie, and don't break the bank. I can fish them with confidence, and without fear of losing a fly or two in the process. It isn't stupid to like the nicer flies, to enjoy purchasing or tying them. Sometimes that is just one way to find more enjoyment in the sport. It really all depends on your goals, and what stage of angling you are in. In fly fishing, we all have different things we consider stupid. For some it could be a view that someone else's methods are unorthodox, or not really fly fishing. For another, fishing is stupid when there is no catching going on, or the catching is not easy. For me, it's probably because on the end of my line you will usually find a stupid fly. They work, and that's why I love them. Don't get me wrong, I enjoy the others, but you'll never find me without my stupid flies. I am curious, what are some stupid flies you would add to my lists?